Context: Toxoplasma gondii, the causative agent of toxoplasmosis can cause significant morbidity and mortality in the developing fetus if the mother acquires acute infection during pregnancy. Transmission rate to the fetus increases from 15-65% with increasing gestational age. However, the severity of congenital disease decreases with increasing gestational age. Aims: To study the seroprevalance of Toxoplasma gondii in central India. Subjects and Methods: A total of 68 pregnant women between gestational age of 24-36 weeks were included in this prospective study during July to December 2013. All were attended at the antenatal clinic of Department of Obstetrics and Gynecology and most of them belonged to rural areas. Samples were collected and antibodies for Toxoplasma gondii were detected by using commercial ELISA kit from Calbiotech Inc, USA. Results: In our study, 14 (20.58%) out of 68 pregnant women were positive for toxoplasma IgG antibodies and 19 (27.94%) out of 68 were positive for IgM antibodies. However, only two i.e. 2.94% were both IgM and IgG positive. Acute infection during pregnancy was diagnosed if IgM positivity is there. Conclusions: Our study recommended that pregnant women should be screened and educated concerning the risk factors that contribute to toxoplasma infections and the importance of taking preventive measures. Aims: The main purpose of this study was to make an initial assessment on the possibility of anaerobic treatment of an extremely high strength leachate streams generated at Isfahan composting plant. 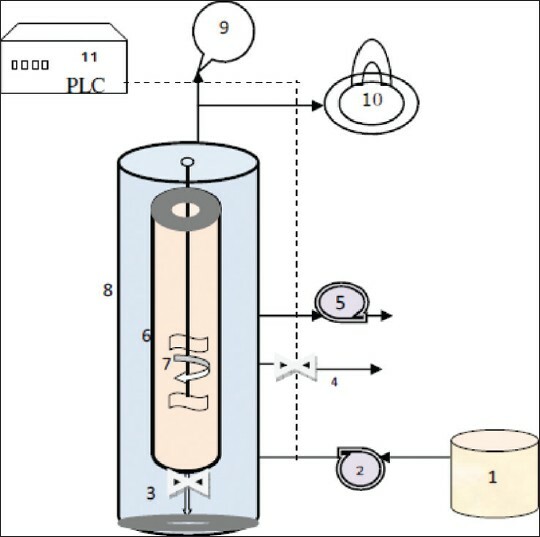 Materials and Methods: In this interventional study, the pretreated composting leachate was fed intermittently to a anaerobic sequencing batch reactor (ASBR) at increasing steps of 6 g chemical oxygen demand (COD)/l.day (hydraulic retention time [HRT] =23 h), 33 g COD/l.day (HRT = 18 h), and finally 36.5 g COD/l.day (HRT = 12 h) for about 10 months. Reactor performance was investigated by measuring pH, total suspended solids (TSS), electrical conductivity, biogas production, COD, and TSS removal twice a week. Results: In pretreated composting leachate, biochemical oxygen demand 5/COD ratio was ranged 0.64-0.8. The pH value in ASBR was between 7.47 and 8.15 without any pH adjustment throughout the study. Conclusion: Although in loading rate of 11 g/l.day, most of the pollutants were decreased significantly, but aerobic process is required to ensure achieving national standard values for discharge in receiving waters. Introduction: Chandigarh, also called city beautiful, located at the foot hills of great Himalayas lies in the high earthquake prone zone (Zone IV). 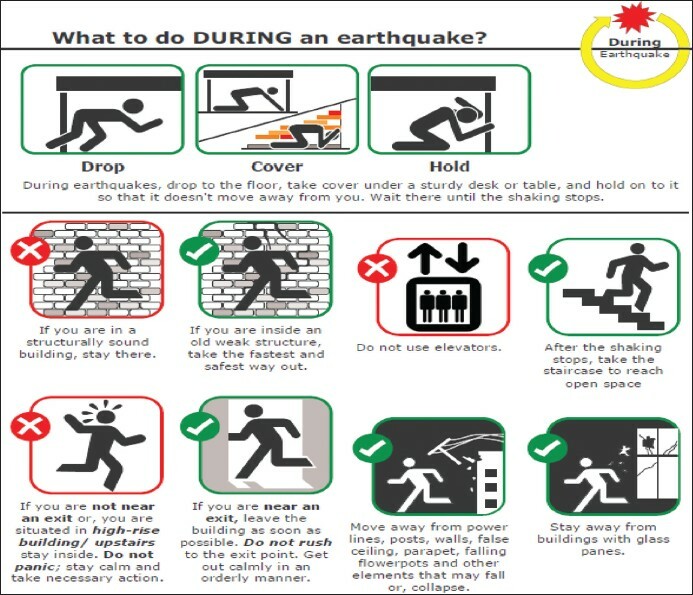 Since historical times the area has experienced many quakes of magnitude 6 and above and is vulnerable in future. Thus, the present study exercise was done in one of the multispecialty tertiary level hospital of North India to evaluate a hospital preparedness to overcome any disaster. Methodology: To conduct the drill, administrative block of the hospital was specifically chosen. Mock drill was executed in three phases viz. Pre disaster briefing, Emergency response practice and Post disaster evaluation. One day before prior to the drill, the whole staff was familiarized with preparedness plans and expectations. Results: On the day of drill, warning siren was activated in the morning (10:32 AM) for one minute simulating period of shaking. Whole staff quickly left their chairs, hid under their tables or safer places. After one minute time, siren was put off; rest of the stuck staff ran out and moved away from building to the evacuation place. Within minutes rescue teams (police control vans, fire fighting vehicles and ambulances) arrived. Whole area was cordoned off immediately. They rescued out the injured ones and ambulances shifted them to the hospital. Fire fighting tenders put off the fire in one of the engulfed in fire. Electric supply of the whole block was cut off. Critical patients were given first aid at the site and later were shifted to hospital for further management. In a three hours exercise, a total of fifteen injured were rescued. In the Post Disaster evaluation roles and responsibilities and feedback was taken from staff. Measures were started to plug the gaps found in the exercise. Conclusion: Though, it is a first such drill conducted in a Hospital scenario in the region, such drills need to be conducted regularly based on an all-hazards approach and involving patients from patient care areas also. Introduction: Risk assessment is the ability to identify risk factors on one hand and to analyze risks and to select appropriate strategies for controlling and removing the risks. The purpose of the present paper is to identify, assess, and present suitable actions in order to control, reduce, and remove the risks of the intensive care unit (ICU) in an Iranian Hospital in 2012. Materials and Methods: This research is a qualitative study performed in 2012 through direct observation, interview with authorities and process owners in the ICU, Isfahan, and reviewing the related records and documents. The population included all the nurses engaged with the ICU processes. Failure mode effect analysis (FMEA) standard worksheet was used for data collection. Results: Findings indicate that 58 potential failure modes were identified in the ICU of Al Zahra Hospital, 13 of which were related to infection control, 5 were related to neurological cares, 8 to digestive cares, 6 to sampling, 5 to medication administration, 4 to dermatologic cares, and 17 potential failure modes were related to respiratory cares. Discussion: There are many factors involved in risks of nursing cares. Nurses' overworking with continuous work shifts, inexperienced nurses, stressful workplace, and lack of qualified nurses, endanger the lives of patients. Results of this research may help nurses and managers recognize the factors of work failures and can present a new approach for planning and paying more attention to the safety and health of patients. Introduction: Emergency Medicine is still at a nascent stage of recognition in India, there are very few recognized courses coming into being recently for the same. Moreover Emergency Physicians in an organization providing Emergency medical care is even rarer, as the value placed on this specialty is very less by the corporates. It is normally believed that the profile of an Emergency Physician in a corporate is just stuck to handling the emergency, coordinating between all the agencies concerned, and admitting patients to a hospital and then monitoring patients for the same. This being the only function is mostly done by the primary care doctor of the company. Aim: The current article is meant to create awareness for both the corporates and the Emergency Physicians. Results and Conclusion: Moreover the role of the Emergency Physician is a lot more than just that, and the corporates need to understand added value which an Emergency Physician will bring on the table for them like other medical services in the company. This is from the organization point of view. From the point of view of the Emergency Physician, having a exposure to the corporate world is even rare, as the role involves not only handling emergencies but also understanding the business dynamics of the company, developing strategic plans and also understanding the ground operations for the same. Introduction: As any large project, family physician and referral system program was also facing criticism in the executive process; in order to increase effectiveness of plan it is necessary to find and fix its criticism. In this research some errors occurred with of doctor have been identified by use (FMEA) method. Subjects and Methods: This was qualitative study identified the potential failure modes in this program by using group technique and brain storming. According to this, the researcher applied standard FMEA worksheet which is used by researchers and its consistency is assured and the validity is confined by authority professions. After consulting with urban experts of Isfahan province's treatment services in insurance organization in 2009, a suggestion about the family physician failures that have the highest priority number was proposed. Results : The highest and lowest risk priority numbers are the personal tendency of insured person to be referred to and having his or her book imprinted with the physician (33.83) and not referring the patient required to refer (12.86), respectively. Conclusion: In referring patients without need to refer, referral guidelines developed by the Ministry of Health; Getting a good deal of commitment that people want to refer to and consider the book closure period for these individuals and etc., can decrease these errors. Introduction: Satisfaction of patients is an important index of health care quality, because it provides information about the success of providers in terms of meeting customers' expectations. Due to the importance of this issue, the present study attempted to examine the satisfaction of one of the crowded emergency wards in city of Yazd, Iran. Materials and Methods: This study as a descriptive research was conducted in the emergency ward of Shahid Sadooghi Hospital, Yazd, Iran, in 2013. To collect the data, standard Press Ganey questionnaire was used. The patients or their companions were randomly sampled at the time of discharge from the emergency ward. Findings: Out of six domain (support services, nursing services, reception services, physician's services, internal precinct of emergency ward, and question about general satisfaction), the highest satisfaction was achieved in the dimension of support and nursing services (with means of 82.5 and 82.25 and standard deviations of 14.24 and 15.92, respectively). Then, satisfaction with reception services (mean of 81.21 and standard deviation of 15.48), physician's services (mean of 77.47 and standard deviation of 12.12), and internal precinct of the ward (mean of 77.05 and standard deviation of 15.21) were placed. Minimum satisfaction was obtained from the question about general satisfaction with emergency ward (mean of 75% and standard deviation of 15.54). Mean satisfaction of the patients of this ward was 78.35% (Cl: 76.7, 79.98). Discussion and Conclusion: Considering the mean scores obtained in the studied domains, it seems that emergency ward of this hospital should improve its process and performance, particularly in the domains which had low scores. Context: Prenatal screening for antibodies to TORCH infectious agents is an important tool for diagnosis. Primary infections with TORCH in pregnant women can lead to serious complications that are initially unapparent or asymptomatic or mild infection in the mother but can cause much more serious consequences in the fetus. Aims: The aim of the study was to determine the seroprevalance of TORCH. Settings and Design: This is the 6-month prospective study conducted in central lab of Microbiology department at Sri Aurobindo Institute of Medical Science (SAIMS), Medical college and PG Institute, Indore. Subjects and Methods: Present study was carried out in the serology lab of Microbiology department in a tertiary care hospital and teaching institute; during the study period (July-Dec 2013), total 64 sample were collected for detection of TORCH seroprevalance (Toxoplasma, Rubella, Cytomegalovirus, CMV, Herpes simplex virus, HSV) by the commercially available TORCH ELISA kit following the manufactures instruction. Statistical analysis used: No. Results: Out of 64, tested by TORCH ELISA, 35 (54.68%) were positive for IgG in single infection [Rubella-15, toxoplasma-6, CMV-10, HSV-4] and 28 (43.75%) were positive for IgM [Rubella-4, toxoplasma-19, CMV-5]. In majority of the cases, 82.8% co-infection by TORCH agents were observed in our set-up. Conclusions: Serological screening is contributed to the prevention of congenital infections due to TORCH agent. Therefore, all the antenatal cases should be routinely screened for the TORCH infections, for carrying out early interventions to prevent fetal loss. Introduction: Journey to treat certain diseases or performing surgery in medical centers in another country is called medical tourism. This new industry to earn millions of dollars annually participating countries. Due to differences in hospital quality and cost effective services across the world they are attracting medical tourists. This study aimed to assess the level of preparedness of hospitals in Mashhad was to attract medical tourists in 2013. Materials and Methods: This cross-sectional study in four hospitals in Mashhad which attracts medical tourists (Imam Reza, Ghaem, Doctor Shaikh and Taleghani) was conducted in 2013. Data were collected using a researcher-made Checklist (22 questions), the field observations and interviews with hospital staff. Data using descriptive statistics (mean, standard deviation, and percent) and the Pearson correlation coefficient was also tested. Results: Most preparedness in attracting medical tourists among hospitals was 63.5% and minimum level was 46.75%. Most preparedness related to medical equipment and geographic conditions (87%) and the least amount of preparation on the website (20%). Pearson correlation between the level of preparedness of hospitals and numbers of foreign patients was not significant. Conclusion: In accordance with the regulations of the Ministry of Health hospitals were been in relative preparedness in attracting medical tourists. Hospitals should invest more on their strengths and unique abilities as they introduce their services; their role has become more prominent in this market. It can also be modified on the basis of the comprehensive plan, staff training and improvement of processes to produce the desired result. Introduction: Health care organizations, particularly hospitals should follow a special strategy and implement their security system based on it in order to protect their data. Information security will be provided through performing a series of appropriate controls. ISO/IEC 27002 standard provides guidelines and general principles for starting, running, monitoring and improving information security management. This article aimed to determine the extent of compliance with information security management requirements in academic hospitals of Isfahan University of Medical Sciences. Materials and Methods: This applied study was a cross-sectional research which was performed in 2014. The research population included academic hospitals of Isfahan. The data collection tool was ISO/IEC 27002 standard checklist. The extent of compliance with information security management was examined in six hospital wards, including informatics, admission and discharge, income, laboratory, radiology, and pharmacy. Data was analyzed using SPSS. Results: Mean score of compliance with information security management requirements was estimated 68.1% in Isfahan academic hospitals. The highest level of requirements was related to security policies (76.7%) and requirements of acquisition, development, and maintenance of information systems (76.1%). However, the lowest level was associated with security of human resources (56.7%). Conclusions: Despite the efforts in hospital information system (HIS), hospitals still need more awareness toward principles of information security and management. In addition to investments on technical strategies, more attention is needed concerning non-technical and human factors such as the promotion of employees' knowledge of information security components in order to maintain information security. Introduction: Hospital, as one of the most important departments providing health services needs to regard safety principles due to its especial conditions. This study was conducted to assess safety in the hospitals affiliated to Isfahan University of Medical Sciences. Materials and Methods: This Cross-sectional and descriptive study was conducted in four hospitals affiliated to Isfahan University of Medical Sciences. Data collection instruments consist of the checklist and questionnaire which were completed through observation, the monitoring of documents and interview with the officials of different sectors. These equipments were designed and used in according to Australia`s safety Management Standards. In addition, the amounts of Cronbach's alpha for the checklist and questionnaire were 0.74 and 0.77 respectively. Hospitals safety condition was classified to very appropriate, appropriate, moderate, weak and very weak categories, according to the levels achieved by safety management standards. The study's results were analyzed by SPSS through ANOVA statistical test. Results: The averages and standard deviations of safety management scores of A, B, C and D hospitals were 62.5 ± 7.09, 49.08 ± 9.15, 60.01 ± 9.46 and 60.3 ± 5.76, respectively. The highest levels achieved by safety management standards were found in management, leadership and organization standards with 68.87 average score and also the least ones could be seen in the standard of the plan assuring quality with 36.09 average score. Conclusions: The condition of safety management in studied hospitals was mostly at the average level and in some cases was evaluated lower than expected. Since regarding the safety principles in hospitals are very necessary and crucial, they must be reconstructed and considered in the hospitals' policies and management rules. Introduction: Patient safety is one important aspect of healthcare. Medication errors are among factors threatening such safety. Medication errors not only endanger the healthcare environment but also impose high costs on health system. Therefore, this study investigated the association between nurses' knowledge of Barcode Medication Administration (BCMA) and its implementation at AL-Zahra Academic Hospital, Isfahan, Iran. Materials and Methods: This is an applied descriptive analytical (association) study. The research society included nurses working in different wards of AL-Zahra Hospital with a sample of 242 persons based on Morgan table (95% Confidence Level). A questionnaire with 45 closed questions and a 43 item checklist, the content validity, and reliability of which was confirmed by professors and through Re-Test method and Cronbach's alpha measurement of 0.774, respectively. Data collection was performed through direct reference by researchers, and findings were analyzed using central tendencies and dispersion parameters of descriptive statistics and Pearson Chi-Square tests of analytical statistics. Findings: Findings indicated that the rate of nurses' knowledge of the BCMA and its implementation in AL-Zahra Hospital was 63.1 and 43.9%, respectively, and there was an association of 0.805 between two variables which was not statistically significant. Conclusion: The rate of nurses' knowledge of the BCMA is relatively favorable, its implementation is not desirable, and the association between two variables is strong but insignificant in AL-Zahra Hospital.